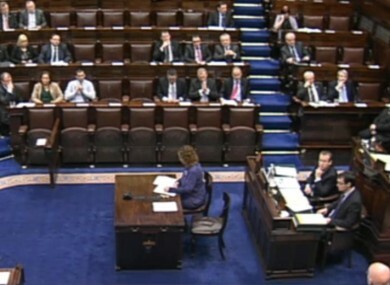 Deputies Micheál Martin and Peadar Tóibín both criticised the lack of facility for debate on the issue in the Dáil today. TDS HAVE VOICED their unhappiness about the fact that last night’s Irish Bank Resolution Corporation (IBRC) liquidation bill was not up for discussion in the Dáil this afternoon. What happened last evening was disgraceful by any standards, particularly the lack of briefing and consultation with spokespeople on the opposition side. He described the situation as getting “more regressive” and “getting worse”, and said that last night the opposition spokespeople were not given the opportunity of ministerial briefings prior to the legislation being brought in. Deputy Martin criticised the lack of engagement today on the issue, saying “it is whatever the executive orders becomes the order of the day”. “This parliament is losing any sense of sovereignty it had,” asserted Deputy Martin, because of the “disconnected way the executive is behaving”. He said they did not know when Leader’s Questions would take place today. Deputy Peadar Tóibín said that he had heard reports that a deal had been struck between the European Central Bank on the promissory notes. “Shockingly there is no provision in today’s order of paper to deal with this issue,” he said. He accused the government of “playing fast and loose with the demo[cratic] process of this country” and asked for a debate to take place today. Deputy Richard Boyd Barrett accused the Taoiseach of showing “utter contempt” for democracy and its citizens, saying that it was shameful the TDs hadn’t more time to read the bill, and asking Minister Quinn if he would advise students in the public gallery to do an exam “without having read their textbooks”. I just got text on my phone saying that RTÉ is reporting that a deal has been done and there is no provision for debate on that matter in the Houses of Oireachtas – that is shameful Minister, are you going to at least allow a discussion? Minister Quinn told the Dáil he could understand why recently-elected TDs were concerned about how quickly the bill passed through the Dáil, but described it as not of this government’s choosing. He said action was taken because of a leak and to protect the interests of Irish people. We have not received formal confirmation of precisely what is to be agreed and when we have that information the Government will resume, it will meet and it will decide what the appropriate response is and as soon as it happens we will then communicate with the house. Martin accused the government chief whip, Paul Keogh, of not engaging with other whips on the issue, and suggested the Dáil will be way behind the public in terms of finding out about the promissory notes deal. Email “TDs question lack of debate on promissory notes ”. Feedback on “TDs question lack of debate on promissory notes ”.